Hillary Clinton is so old that the star she was born under burned out a long time ago. Hillary Clinton is so old that she drinks her gin with a splash of embalming fluid. 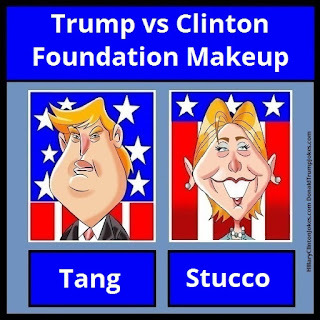 Despite how tired that meme is already, Hillary Clinton's staff writers are still joking that Donald Trump's television makeup looks just like Tang. 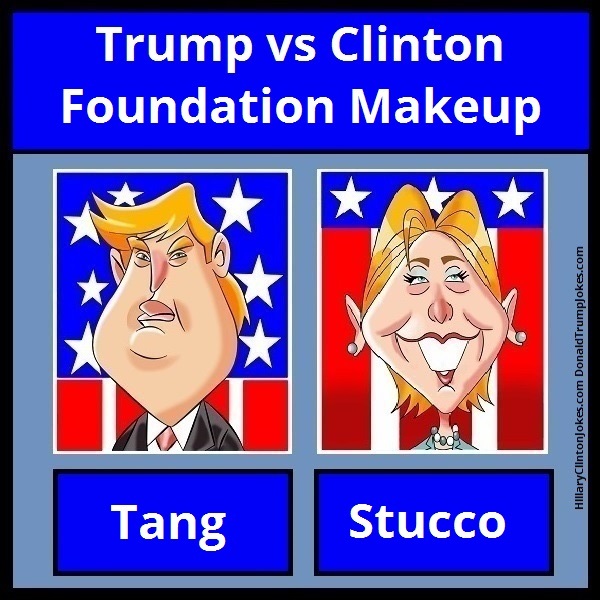 By contrast, Hillary's foundation makeup, stucco, is much less colorful. In an emotional campaign speech, Hillary Clinton denounced hypocrisy. The audience roared with laughter. Hillary Clinton has a new ad campaign targeting male voters. 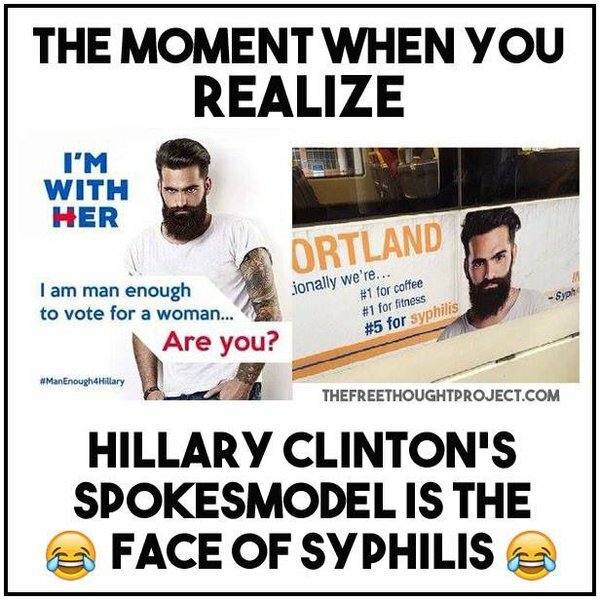 Hilariously, she chose to use the face of a model best known for warning men against the risk of STDs. Hillary Clinton appeared on the Ellen DeGenerate show today and said that she favored her daughter, Chelsea Clinton, for Vice President. Hillary was joking, of course. There's just no way Chelsea could come up with enough bribe money to buy the spot. Hillary Clinton looked up at all the stars in the night sky and realized just how insignificant everyone else is. Q. Why has Hillary Clinton made studying ventriloquism part of her campaign strategy? A. So that she can learn to lie without moving her lips. Q. What kind of bracelets would go best with the orange outfits that Hillary has been appearing in lately? Hillary Clinton is so old that she's already late to her own funeral. When Hillary Clinton finally goes to prison, will Bill be allowed to skip the conjugal visits? Hillary Clinton woke up one morning to find that she could no longer fit into any of her hideous pantsuits, so she immediately went on a crash diet. After a full day of dieting, she told Bill that she had lost five pounds. Bill told her that the five pounds weren't lost; she just needed to take a look behind her. Hillary Clinton is so old that the monkeys actually evolved from her. Jon Stewart, Rosie O’Donnell, Samuel L. Jackson, and Cher, among many other Hillary supporters, have promised to leave for Canada when Donald Trump is sworn in as the President of the United States on January 20, 2017. To commemorate the date, all flights to Canada will be serving Whine and Cheese on inauguration day. Barack Obama put America in the toilet. Hillary Clinton wants to be the one to flush it. Hillary Clinton is so old that General Ulysses S. Grant burned down her slave plantation during his march to Georgia. Q. How does Hillary Clinton sleep? A. First Hillary lies on one side, and then Hillary lies on the other.